Although attorney Michael Clayton (George Clooney) has been with Kenner, Bach and Ledeen for 17 years, he’s never made partner. Ironically, despite being low man on the totem pole, he still enjoys a certain grudging status, since the nature of his work makes his services invaluable to the prestigious Manhattan law office. You see, as the firm’s fixer, Michael’s job involves mopping up other’s messy situations by any means necessary, even if that might sometimes mean breaking the law. For example, when a wealthy client is involved in a hit-and-run accident, he’s quickly called-in to in order to devise the best strategy to keep the story out of the press. But nothing in his checkered career has prepared him for the chain of events about to unfold in the wake of the apparent mental breakdown of Arthur Edens (Tom Wilkinson), a colleague defending a billion-dollar class action suit against U-North, an agro-chemical company accused of manufacturing cancer-causing chemicals. After six years as the lead lawyer on the case, Edens inexplicably did a striptease while mumbling incoherent flibbity-jibbity to himself during a deposition being conducted in Milwaukee. So, the firm’s managing partner, Marty Bach (Sydney Pollack), rushes his reliable “fixer” to Wisconsin to do damage control. However, Clayton soon discovers that he’s in over his head because Edens hasn’t merely gone off his meds as suspected, but has had a crisis in conscience and plans to go public with some very incriminating U-North internal memos. Plus, the rogue attorney has developed a crush on one of the plaintiffs, a cute, young, milk-fed farm girl he hopes to seduce during a rendezvous in the Big Apple. 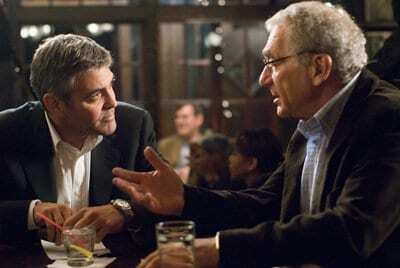 “I’m not a miracle worker. I’m a janitor,” an exasperated Clayton complains about a situation that even he can’t cover up completely. This doesn’t sit well with steely Karen Crowder (Tilda Swinton), U-North’s chief in-house counsel who reports directly to CEO Don Jeffries (Ken Howard). With so much money at stake and no longer trusting anybody at Kenner, Bach and Ledeen, behind closed doors the company’s upper management devises its own dastardly plan to make the problem go away. 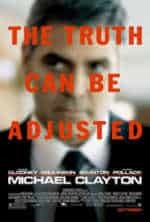 Thus, corporate ethics is at the center of the intricate web woven by Michael Clayton, a modern morality play marking the directorial debut of Tony Gilroy, a seasoned scriptwriter best known for the Bourne trilogy. Here, Gilroy has assembled a most talented cast capable to execute his convoluted potboiler, a chilling tale which subtly suggests that the criminal behavior of U-North might be par for the course among power-crazy captains of industry in today’s globalized economy. Employing a wraparound as a cinematic device, this flashback flick opens with some visually-captivating pyrotechnics provided by the deliberate detonation of Michael’s late model Mercedes by saboteurs. He survives the explosion, then the plot rewinds to four days earlier, subsequently devoting itself to delineating how the hunter had come to be the game. By the closing meta-tableau, which is actually a repeat of the film’s beginning, it’s now no surprise why Clayton’s been reduced to crying out to his employers-turned-tormentors, “I’m not the guy you kill. I’m the guy you buy off.” Erin Brockovich (2000) meets A Civil Action (1998), but featuring a flawed hero with blood on his hands and an ace up his sleeve.